(From Tamron lens literature) Tamron has announced the launch of the 28-75mm F/2.8 Di III RXD (Model A036) -- a high-speed standard zoom lens for Sony E-mount full-frame mirrorless cameras. This new zoom lens delivers superb optical performance, including both outstanding image quality and beautiful background blur effects (bokeh) only possible with a fast aperture, thanks to a new optical system designed specifically for mirrorless cameras. The lens will be available at Tamron's authorized USA retailers on May 24th at $799. The usefulness and versatility inherent in compact full-frame mirrorless cameras are enhanced by this new Tamron lens' compact size and lightweight -- it measures only 4.6 in. and weighs just 19.4 oz. The Model A036 incorporates an all-new high-speed and precise AF driving system. The RXD (Rapid eXtra-silent stepping Drive) strikes a balance between speed and silent operation, making it perfect for both video and still image capture. In addition to shooting portraits with creative, defocused backgrounds, photographers can enjoy dynamic wide-angle expressions like never before thanks to a Minimum Object Distance (MOD) of 7.5 in. at the wide-angle zoom setting. The lens also features Moisture-Resistant Construction that is useful in outdoor photography, plus hydrophobic Fluorine Coating that is highly resistant to fingerprints and dirt. In addition, the Model A036 will fully match with various camera-specific features including the in-camera lens correction and Direct Manual Focus (DMF) system features of Sony cameras, enabling this new zoom to take full advantage of the advanced functions that ensure comfortable user experiences. The Model A036 features a new design that leverages the advanced image quality of the latest full-frame mirrorless cameras. To balance beautiful bokeh with high image quality, the optical formula (15 elements in 12 groups) includes a special XLD (eXtra Low Dispersion) element, LD (Low Dispersion) element, GM (Glass Molded Aspherical) element and two hybrid aspherical lens elements in the optimal arrangement to correct aberrations and reduce the overall lens size. The lens also employs Tamron's BBAR (Broad-Band Anti-Reflection) Coating that boasts exceptional anti-reflection performance throughout the entire zoom range, even when shooting in backlit conditions. In addition, incorporating the nine-blade circular diaphragm design, the lens will perform in versatile situation, providing beautiful soft portrayal at wide open aperture to a clear and sharp image when stopped down. 4. All-new "RXD" stepping motor AF unit is excellently quiet and therefore perfect for video capture. 5. 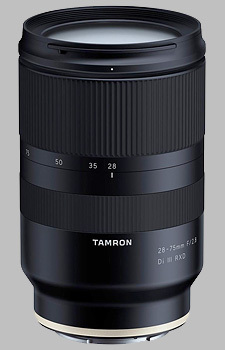 Consistent with Tamron's exciting, ergonomically superb next-generation design. The Model A036 features a mirrorless-oriented design that adheres to Tamron's new "human touch" lens design concept. As signified by the Luminous Gold brand ring, careful attention to detail has produced an optimum shape reflecting the characteristic look of a Tamron-branded lens, whether on its own or attached to a camera body. This design emphasizes consistent brand identity combined with ease of operation. * Features vary by camera. Please consult your camera's instruction manual for details. As of March 2018. The build quality of this lens is ok but not very well. It feels cheap. Autofocus is exceptionally silent and relatively fast in my experience. The lens had some issues with the autofocus on Sony cameras. This problem was solved by a firmware update. The image quality is great. Its a great lens for filming.